Located in the east of Java Island, Bali is Indonesia’s premier tourism object that is well known around the world. 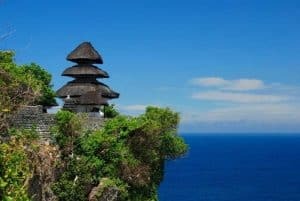 Besides famous for its natural beauty, especially the beach, Bali is also famous for its unique and interesting arts and culture. 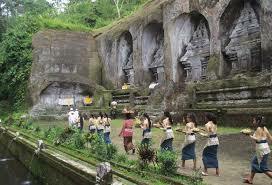 Bali as a complete and integrated tourist destination has many interesting sights. You can get a complete package of Bali holidays with a million charms of natural beauty and culture. In fact, you can also get a different spiritual experience there. Here are the list of best places to get Spiritual Experience in Bali. Actually Gitgit Waterfall originally named as Waterfall Colek Pamor Sukasada. Location of this waterfall is very close to the waterfall gitgit, so many residents call it a waterfall of Gitgit 2. This hidden waterfall has a height of about 20 meters. Source waterfall is also unique because it comes from the cave. The cave is a basement of the flow of water from Buleleng to Gitgit. The clear and fresh water will attract anyone to immediately enter the pond of this waterfall. On the right and left waterfalls, there overgrown with various green trees. It create a waterfall atmosphere seems like on a painting. In addition to swimming, other activities you can do are as a place of meditation and spiritual activity. Even those activities will be developed by the Sadar Wisata Group. This is certainly understandable because the atmosphere is very supportive, ranging from air to the scene. Next, you can try up the stairs to the top of the hill Bisbis, which at the top of the hill there is a temple called Pura Lempuyang Luhur. It will be a fun and challenging spiritual journey. After arriving at Pura Pasar Agung, a Padmasana pelinggih you can meet here, you can take a break while doing worship. Pura Lempuyang Luhur by tourists used as a popular trekking destination, for trekking to the top, you have to climb thousands of stairs, the number of stairs around 2000s. It needs good stamina, although there are many places to rest, if by chance in Hindu days some of traders’ stalls can be found in some places. This festival is an annual yoga celebration, which also features dance and music performances taking place at “Purnati Center for The Arts”, Ubud, Bali. This activity is intended to encourage positive change at the personal level of festival participants as well as communities participating in various programs. As a great celebration, it brings world-class maestros of yoga. This festival presents a full program that is guided by more than 20 world class yoga teachers and 35 dance artists and musicians from Indonesia and abroad. Participants can attend numerous yoga, dance and music workshops during the day, and world-class live music performances in the evenings. This annual festival is usually held every April to May every year. 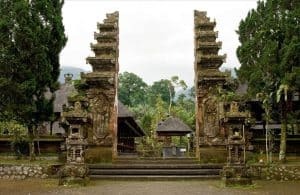 Pura Luhur Batukaru is referred to as the worship of God as the meaning of the title of Lord Ratu Hyang Tumuwuh which means God as the cultivator. 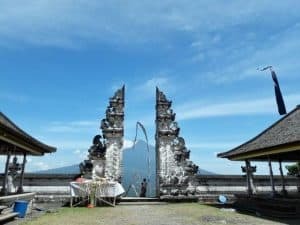 Location of this temple is located in the western part of Bali Island on the southern slopes of Mount Batukaru in Wongaya Gede village, Penebel district, Tabanan regency. Pura Luhur Batukaru is a temple as a place to worship God as God Mega God. Because of its function to worship God as a God who cultivates plants. After praying in Batukaru you can go to the shower located in the southeast of the main temple but still in the area of Pura Luhur Batukaru.Air this shower is to purify themselves with gargling, washing face and foot washing in the shower continued to pray in Pelinggih Pura The fountain is a sign of sacred cleansing and niskala or mental birth as the main condition for worship can be done with physical and spiritual holiness. The existence of Pura Uluwatu (Uluwatu Temple) has a great religious and spiritua l value for the Balinese people. Uluwatu temple environment has been established since 11th century. It was founded by Empu Kuturan. Then the place was chosen by Reverend Dahyang Nirarta to reach the moksa and climb the essence of the purity of the clean soul of the dots and sins. This temple is a Pura Sad Kahyangan which is believed by the Balinese Hindu community as a buffer of 9 winds. You could feel the existence of the spiritualism in this place by following the ritual of cleansing worship and prayer in this place. Sixty kilometers east of Denpasar, there is one place in Bali that offers an anti-mainstream tourist experience. 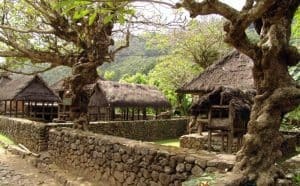 This place is like taking tourists back and forth into the corridor of time, while Bali is still traditional, towards the other side of Bali that is rarely seen by tourists, Bali Aga or Bali ancient village of Tenganan. This Tenganan village is one of the oldest and most modern villages, where men and women are alike, there is no caste system all the same. If Tenganan is good at traditional ceremonies that are usually held in January, February, June, and December. Gaining a different spiritual experience by following their ritual prayers, how solemnly they pray. 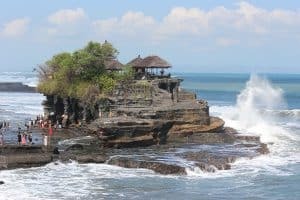 Tanah Lot is a tourist location for you who want to witness firsthand the various religious ceremonies of Hindus. One of them, the religious ceremony Piodalan (anniversary of the temple) is always held every 210 days according to the calendar Saka or four days after the feast of Kuningan. You can also visit the Holy Water Cave that flows springs that come from the middle of the sea. The cave of the freshwater source is now a sacred. Besides being used for Hindu worship purposes, tourists are allowed to drink the holy water or simply wash their hands and face. When the water is drunk, it feels very fresh and no saltiness at all. People also believe that drinking the holy water can provide many benefits, such as cure all diseases and increase fertility couples. Ulun Danu Bratan Temple is one of the largest water temples on the island of Bali. 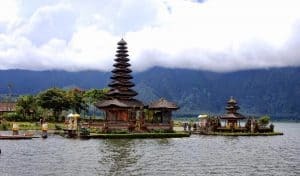 The temple that stands beautiful on Lake Bratan is actually functioned for the offering ceremony for Dewi Danu or in Balinese language means Goddess of Lake and Goddess of Water in belief of Hindu Bali. In addition to being a shrine to the practice of worship rituals to the goddess gods, this temple was also the site of the Melasti ceremony held a day before Hari Raya Nyepi. The complex of sacred building Pura Ulun Danu Bratan in Bedugul tourist area consists of four parts of the sacred building. You can explore them one by one and get your spiritual experience there. You will see how they worship, make offerings, and so on. 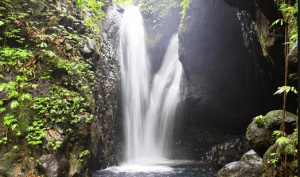 Gunung Kawi Religious Tourism can be reached for ± 4 hours from Pasuruan. Its small, winding road becomes an experience for visitors. Its location is far from the city atmosphere with the many trees along the eye and cool view of the city to greet the tourists. Every day tourist attractions that become a monument of honor Eyang Djugo and Raden Mas Iman Sudjono is never empty of visitors. Visitors from various regions of Indonesia and even foreign tourists can be found in the open place starting at 08.00 pm. More than a hundred visitors meet the tourist attractions in the highlands of Malang. On certain days, such as Friday night Kliwon and Shura nights, it can bring many times visitors on weekdays. This place is actually a spot of purification in Bali. 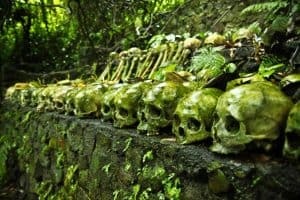 Trunyan village is said to be the oldest village in bali carrying out the burial just by putting its corpse on a special place called ‘seme wayah’. Although there are many bodies that are placed there, but there is no foul odor caused by one body was there. This may seem unusual, but that is the reality. Trunyan village is located on the west side of Lake Batur, and close to Mount Batur mountain which became the ranks of Geopark and became a mountain of climbing. Trunyan Village has been known by domestic and foreign tourists as a unique tourist attraction in Bali. When you visit this place, you will experience a different spiritual sensation when you see the corpses with offerings near Trunyan trees. Those are the places that you can find to get spiritual experiences in Bali. Bali is a place that really good for healing your mind. When you are tired of your life activities, you can come back there as you want, as it is possible to relax your body.